I admit it, I'm a fair-weather fan when it comes to summer. While I enjoy taking the girls to the park, having barbeques with friends and watching parades in our surrounding cities and towns, there are two things that turn my excitement into disappointment far too quickly: the heat and the mosquitoes. While sticking to the shade, staying hydrated and remembering my sunglasses help when the temperatures rise, there's really not much that bothers me more than standing around swatting at pesky mosquitoes as they threaten to turn my entire family into an itchy, unhappy mess. And while I can always turn to a can of bug spray, coating myself and my children in smelly chemicals doesn't always top the list of things that I like to do. 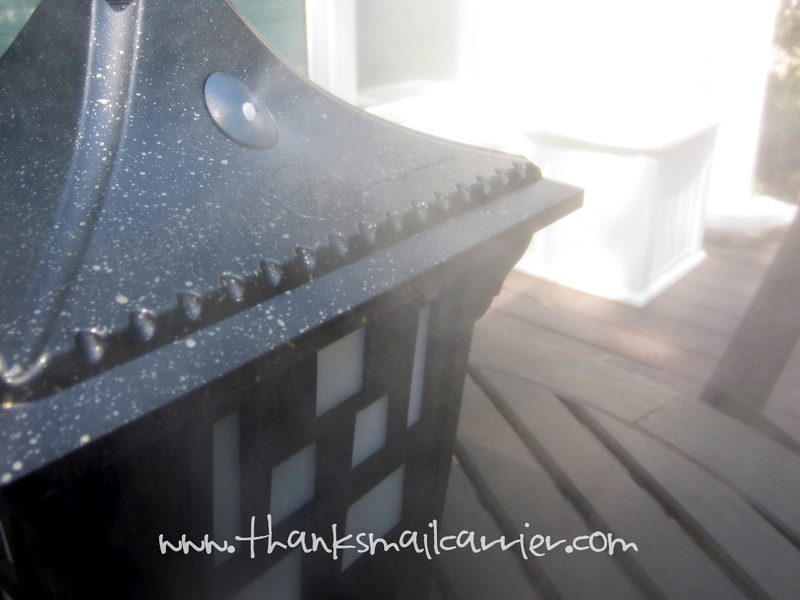 Instead, this season I've found the new, natural way to simply and effectively keep mosquitoes from ruining our outdoor fun thanks to the Terminix ALLCLEAR Mosquito Mister Lantern with Naturals from Universal Pest Solutions. Proven to quickly and safely repel more than 95% of biting mosquitoes from areas up to 300 square feet (about the size of an average deck or patio), the Terminix ALLCLEAR Lantern is the effective and safe bug protection families desire in a 11.5" x 7.75" x 7.75" attractive package. Whether used for dining al fresco, partying poolside, fishing, camping, boating or more, the design blends well with any outdoor space while the proven technology and botanical lemongrass formula work to quickly and naturally repel mosquitoes for hours. 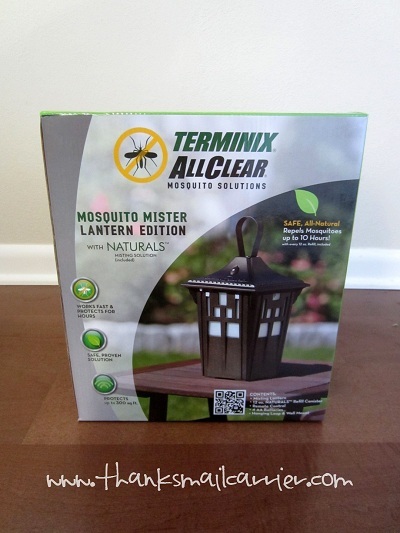 Thinking that the Terminix ALLCLEAR Mosquito Lantern sounded like the answer to enjoying our bug-free time outside without worrying about harmful chemicals, I was eager to put it to the test. 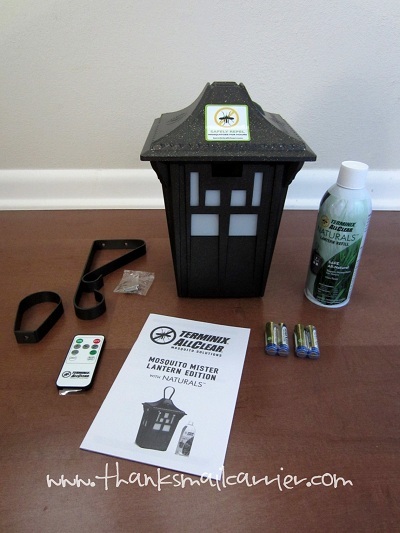 As I pulled the pieces out of the box, right away I appreciated that this Lantern comes fully assembled and only requires the batteries (provided) and spray (also provided) to be installed right inside. After opening the top, it only took a minute before I had the four AA batteries in place and was removing the lid on the 12oz bottle of Naturals repellent. Unfortunately I managed to not read the directions close enough to notice that they clearly stated to "remove the spray nozzle" as I simply removed the cap. I quickly realized that the lid of the Lantern was causing the Naturals to spray all over the floor. Oops! ... it was easy to see that this was going to be an item that was going to become a permanent feature in our yard. While we haven't yet used the optional wall mount to hang this (although I foresee us doing so to conveniently hang it from the overhang of our deck), just placing it on the table shows how the antique bronzed finish looks great in any outdoor space! When it comes to using this lantern, it couldn't be much easier or more intuitive thanks to the user-friendly, clearly-labeled remote control. 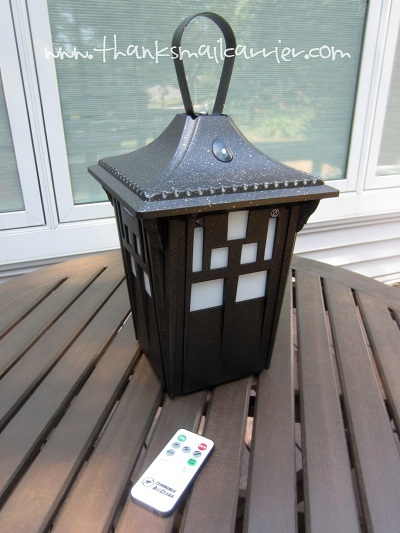 Not only does the pocket-sized remote allow you to control the Mosquito Mister Lantern from a distance (making it possible to leave it hanging on the wall mount or just not have to go close to it when it sprays), but a single press of a button can customize the level of mist dispensed. 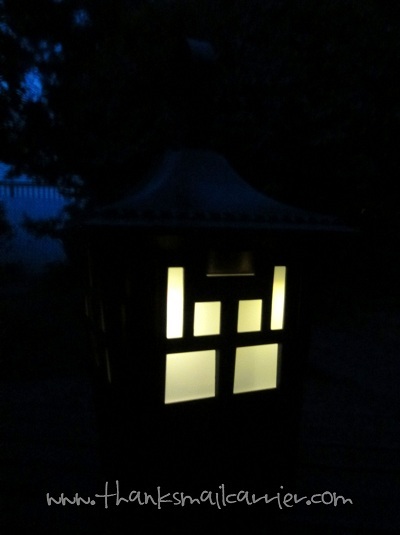 The button with one mosquito equates to light activity and the Lantern will mist every 10 minutes. Two mosquitoes, or medium activity, mists every 7.5 minutes, while three mosquitoes (heavy activity) mists every five minutes. Each application lasts for five seconds and is preempted by a blinking light and two beeps so that you're prepared. Easy enough, right? Or, if you prefer to activate the spray yourself, the simple Mist Now button allows you to control when it is dispersed instead of using the automatic settings (or along with them, if needed). At the same time, if you aren't the one holding the remote (or if you have misplaced it), there is a small button right on the Lantern itself that also allows you to manually control the spray. Along with the protection that your outdoor space receives from the 100% all-natural lemongrass formula, the Terminix ALLCLEAR Mosquito Mister Lantern with Naturals has the added bonus of being a convenient, functional lantern. Another one-button operation, simply press the Light on the remote and you have a soft glow that adds right to your evening or night festivities. As Terminix was already a name that came to mind when thinking of mosquito control, I've been happy to see that the ALLCLEAR Mosquito Mister Lantern has lived up to my expectations. Being able to have this in our yard has made it so extremely easy to protect our family and friends with the touch of a button and has removed the hassle and annoyance of trying to remember to reapply later on. Considering that the Naturals spray is completely non-toxic, contains no synthetic chemicals or residues, and is safe for the environment, I haven't had to worry once about any chemicals on the kids or pets. Instead, the attractive, weather resistant look simply adds to the ambiance of the outdoors and would easily enhance the beauty of just about any outdoor space. 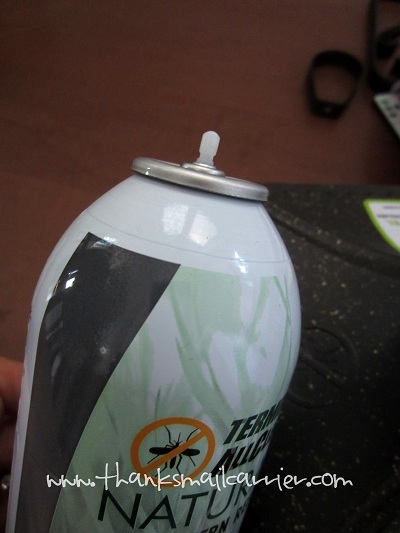 More information about the Terminix ALLCLEAR Mosquito Mister Lantern with Naturals can be found at TerminixAllClear.com, as well as connecting with them on Facebook and Twitter. This high quality product retails for $79.99 (with additional Naturals Refills sold for $7.99) and can be found at ACE and True Value Hardware stores nationwide as well as online from Amazon.com, Target.com, HomeDepot.com and more. Thank you for sharing this. I have an allergic reaction to mosquito bites so we tend not to go out side when it starts to get dark. Maybe now I can enjoy the nice evenings. Oh my gosh, our home/backyard so needs this lantern. 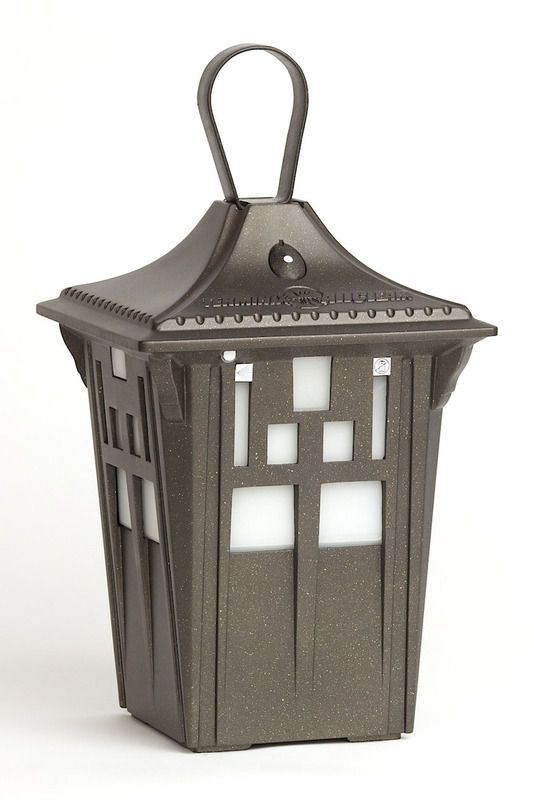 And I'm happy to know that I don't have to subscribe to Terminix services in order to purchase this lantern. I love the fact that this has dual purpose! !